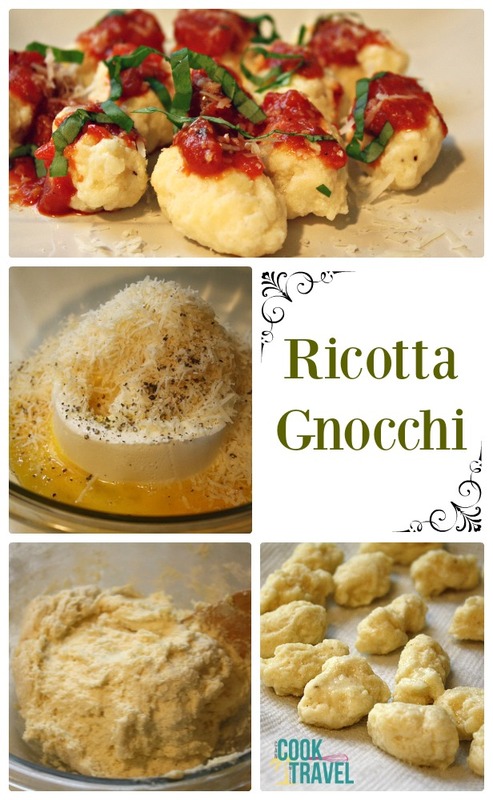 You are here: Home / Blog / Main Dishes / Feeling Italian with Ricotta Gnocchi! I love gnocchi. 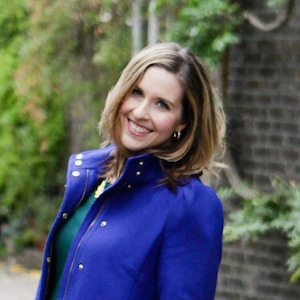 There was a restaurant where I live that used to have the BEST potato gnocchi and inspired me to do my very first gnocchi recipe post way back in year one on my blog. And a couple of weeks ago when I was in Napa at the restaurant Bottega, my coworker got the Ricotta Gnocchi and I totally had foodie regret for not getting it too. So there wasn’t a doubt in my mind that this month I had to give it a try. If you’re not familiar with gnocchi, it’s an Italian dish and the traditional variety is a potato gnocchi. It’s delicious, but I really wanted to see what the Ricotta Gnocchi was all about. I mean, I adore cheese, so it had to be good. Oh and it was so good, but even better than I imagined! 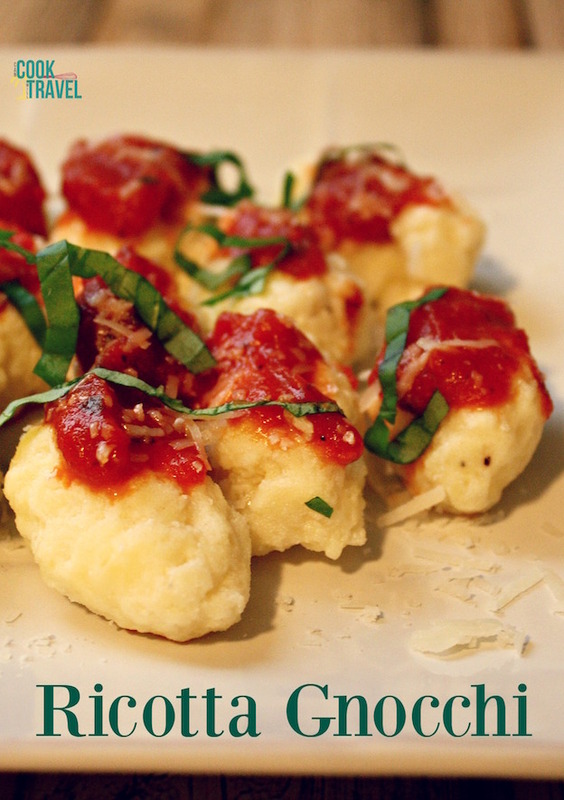 So let’s chat about how this Ricotta Gnocchi comes together. It’s basically a dough that consists of ricotta cheese, Parmeggiano Reggianio cheese, eggs, salt, pepper, and flour. Then you drop about a teaspoon or so of the dough into boiling water and let it cook. The cool part of gnocchi is that when it’s finished cooking, the little pillows of goodness rise to the top. Then you’ll scoop them out of the water and you’re ready to enjoy. When it comes to serving the gnocchi, you’ll often see them served with some sort of a butter sauce, but I prefer mine with a little marinara. So I topped each gnocchi with a little marinara, some more freshly grated Parmesan and some fresh basil. Oh. My. Goodness. Serve the gnocchi while it’s still warm, and you’ll find that each bite nearly melts in your mouth. The cheese in the center is warm and melty and is seriously so delightful! The gnocchi should reheat pretty well if you go ahead and boil all of it at once. But I found that when I refrigerated the leftover dough and cooked up some more gnocchi on demand, it was just as good (maybe even better) as it was on day 1. Also I felt the dough was a lot easier to work with the next day as it was chilled and was a little less messy to work with. 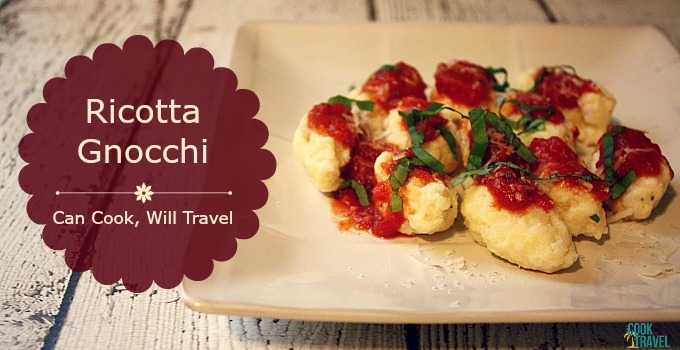 I’m so excited for you to try this Ricotta Gnocchi recipe! It’s faster to make than potato gnocchi (because you have to cook and mash the potatoes) and it’s a bit lighter as well. One year ago: Tomato Strawberry Gazpacho . . . Take That, Summer! Two years ago: Pesto Shrimp with Snow Peas over Quinoa = Healthy & Fast! Three years ago: It’s Pad Thai Time!